Varsity Sports teams up with Ithemba Foundation to encourage students to speak up about mental health issues. Wits University sports players will show their support for mental health awareness by wearing green shorts throughout Varsity Sports tournaments as part of the new ‘Speak Up’ campaign. The campaign is a collaboration between Varsity Sports and the Ithemba Foundation. It is aimed at combating the stigma and silence around mental health issues. One of the aspects of the campaign is to have the top players in each team wear lime green shorts during matches across all sporting codes, such as the upcoming Varsity Football tournament in July. Lime green is the internationally recognised colour of mental health. Varsity Sports operational assistant and head of the Speak Up campaign, Cameron Peverett, said that the campaign’s aim is to encourage students to speak out when they experience symptoms of mental illness in order to combat the stigma and ignorance around mental health. “We are getting experts to talk about [mental illness] with students especially as studies have shown that student athletes experience more mental strain than the average student. We want to help students find solutions they can work through as the pressures of life and responsibilities keep mounting,” Peverett told Wits Vuvuzela. A 2016 study published by The International Journal of Environmental and Science Education found that student athletes are more prone to depression, anxiety, and psychological stress compared to non-athlete students. The Ithemba Foundation is a Stellenbosch-based organisation dedicated to educating people about mental health and breaking the stigma attached to mental illnesses such as depression and anxiety. According to Ithemba Foundation founder, Professor Lizette Rabe, the foundation hopes the campaign will educate students more about mental health and encourage them to speak out when they need help. “If we can get the younger generation to normalise mental health it will be a huge victory. We need to start talking about mental health in a healthy way and manage it as we would a chronic condition like diabetes,” she told Wits Vuvuzela. The campaign will run continuously throughout the year. Head of Wits Sport Adrian Carter said, “We fully support [the campaign].” Wits Sports will actively participate in the campaign by having their top players don the green shorts. The Varsity Sports website includes the details of campus wellness centres at all of the participating institutions on its ‘Speak Up’ page. 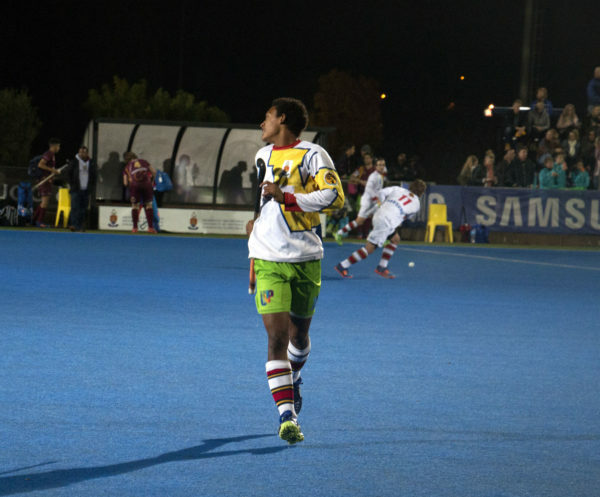 FEATURED IMAGE: Wits Hockey player Brandon James donned the green shorts at the Varsity Hockey semi-finals held at the University of Pretoria on Monday, May 14.